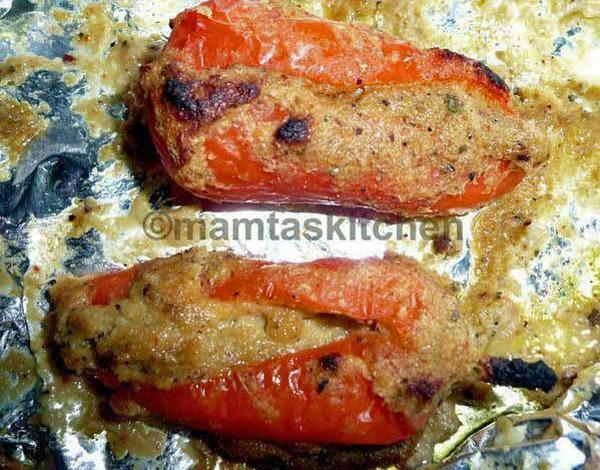 Tandoori chicken is probably one of the most popular non-vegetarian dishes on an Indian menu. The name Tandoori simply means cooked in a Tandoor, a traditional, Indian clay oven. However, modern tandoors are mostly electric these days. Most of us do not have a tandoor in our homes, a very hot oven works quite well instead. In many restaurants, tandoori chicken is still made with ready-made tandoori mixes, with bright red colour. I prefer not to add any artificial colouring to mine. 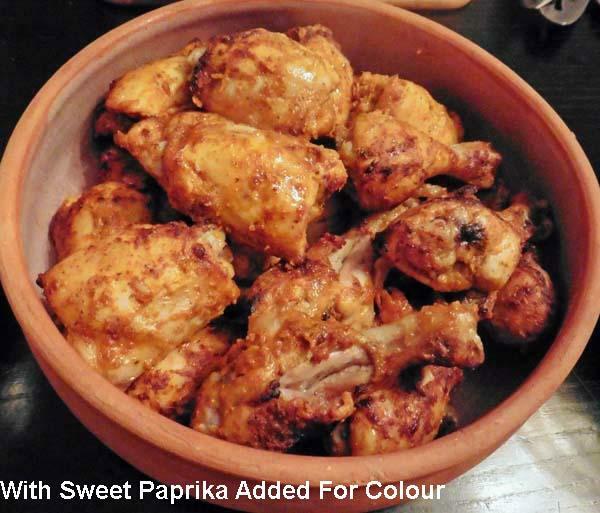 If you like the red colour, add sweet paprika to your marinade, as in picture 2. 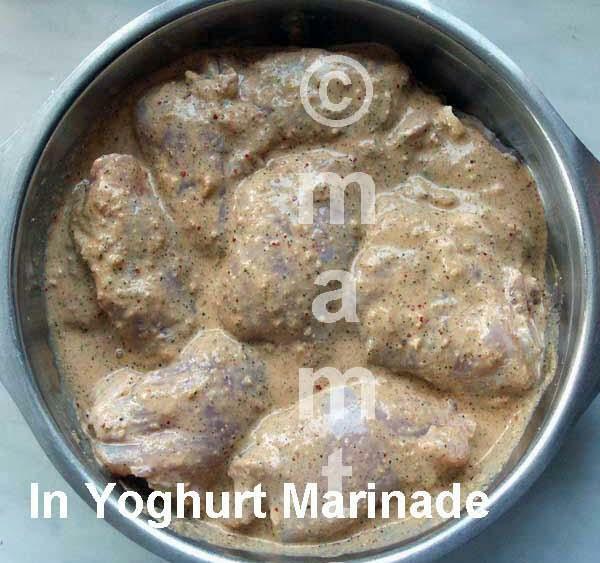 This marinade is very easy and quick to prepare using an electric blender. You can alter the spices to suit your own taste. Any chicken pieces are fine for this recipe, but my choice is small drum sticks or small thigh pieces on bone. Bones keep the meet moist. In Indian cooking, skin is always removed from the chicken, before it is cooked, as I have done here. 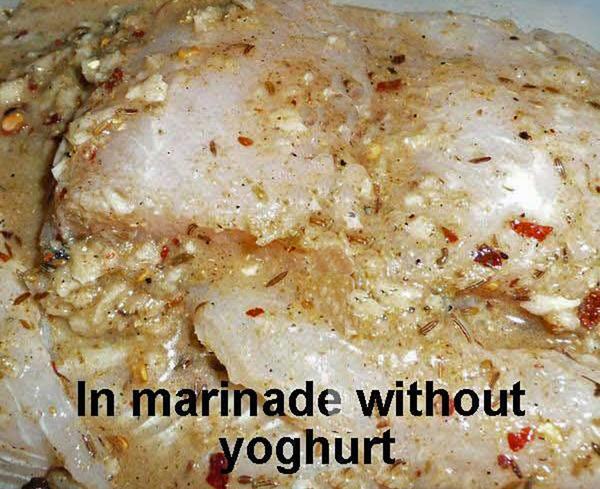 I mostly make my marinade with yoghurt and lemon, but you can use make it without yoghurt, adding extra lemon juice. Coconut milk instead works well too and gives it a different flavour and slightly sweet taste. 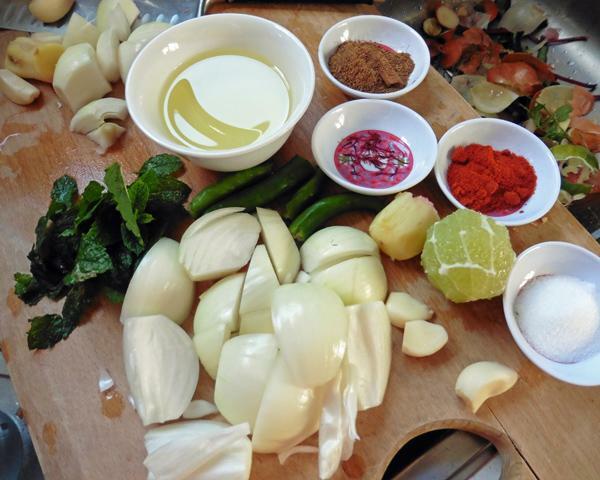 Same marinade can be used for lamb or mutton pieces (tandoori lamb) or indeed vegetables (see composite picture 3), especially if you happen to make a little more tandoori marinade than needed. Marinade vegetables like peppers, aubergines in it and cook in a hot oven for 20 minutes or so. 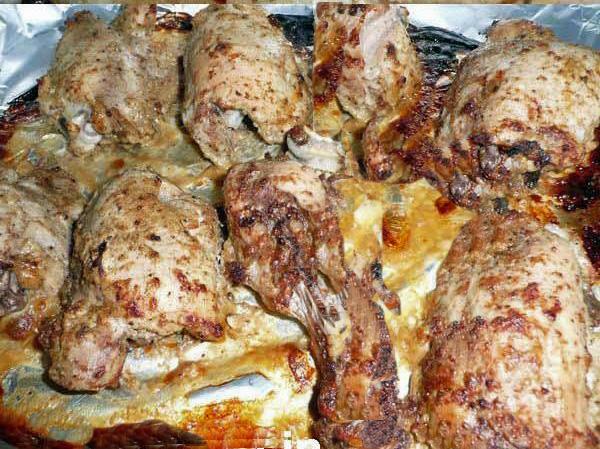 This marinated chicken is suitable for BBQ. Also see BBQ Selection and Marinade Selection. Serves 6. A small carton (150 ml.) of thick yoghurt (adjust amount to how strong your yoghurt is. Yoghurt can be omitted, if you don't have it or are allergic to milk. Add extra juice of half a lemon. Remove skin from chicken. It is easy to pull off if you hold it with a cloth or kitchen towel. J. cloth is good for this, can be thrown away after one use. Prick each chicken piece a few times with a fork. This helps to absorb flavours. Place ginger, garlic, chopped onion, peeled lemon and half the rind, green chillies, coriander, saffron, cooking oil, salt, cumin seeds, garam masala, all together in a blender and blitz for a few seconds, until it is a smooth paste. Add yoghurt and blitz again for a couple of seconds to mix everything well. Do not over blend at this stage. Taste and adjust salt and spices. Both should taste extra strong at this stage, as they will be added to 1 kilogram of chicken and thus dilute. 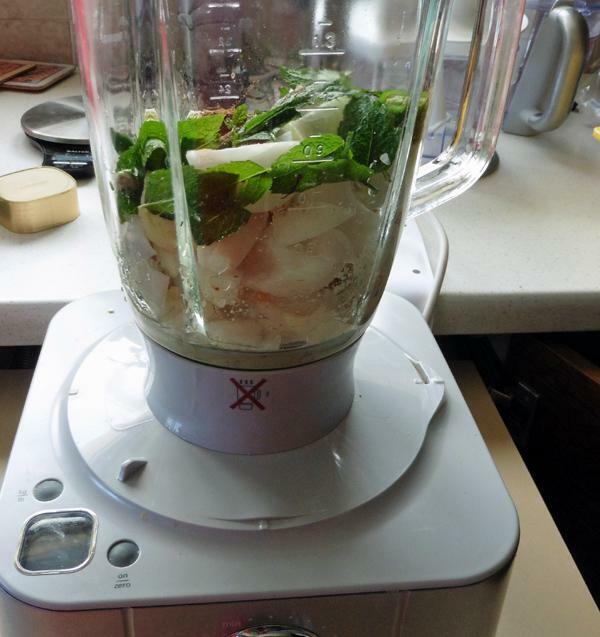 Mix with chicken pieces, place in an airtight box and leave for a few hours, preferably overnight, in the fridge. Heat oven to 250-300 C or 475 F (a Tandoor is supposed to be very hot). My oven heats to 300 C/572 F and I use that. Place chicken pieces on the tray and bake in the centre of a hot oven, until nicely browned. Time varies for different ovens but it usually takes around 25-30 minutes in a preheated oven. You may need to turn the pieces over half way through cooking, but usually this is not necessary. You may need to drain off the excess liquid from the cooking tray halfway through, so that the cooked chicken is not soggy. Save the drained liquid to make gravy. See below . When ready, chicken pieces should look crispy and charred in places, as if you have cooked them on a BBQ. The meat should begin to come of the bones. Chicken should never be undercooked, but do not overcook, this will dry the meat. 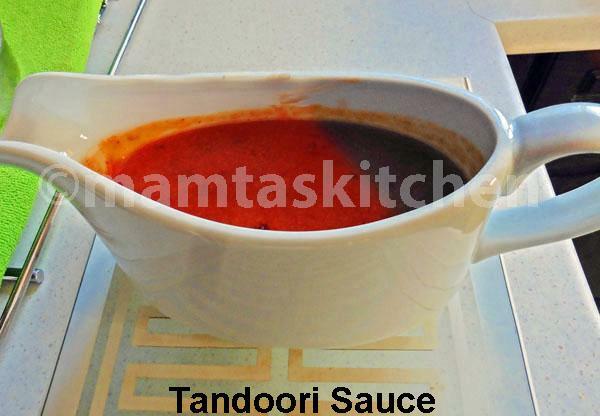 To make gravy/sauce, dissolve 1 tablespoon of flour in 2-3 tablespoons of water or cold milk, add it to the leftover tandoori marinade that you had drained earlier and boil for a couple of minutes, until it thickens like custard. Serve alongside the chicken. Alternatively, you can bring to boil the leftover marinade with a little water and thicken it with chicken gravy granules like Bisto. Be careful not add too much gravy granules, because this will make your gravy/sauce too salty. Serve it as part of a main meal, with other curries, dals Nan. 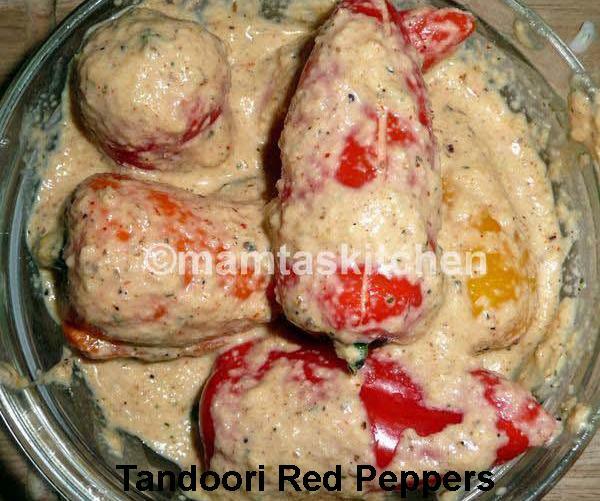 You can also serve Tandoori chicken as a starter or with a salad for a lighter meal. Mint Sauce in Yoghurt goes well with it, as does Green Coriander And Mint Chutney. You can use the same marinade for leg of lamb, add mint leaves instead of coriander leaves to the marinade. Chicken marinated like this, can also be cooked like a curry in a pan or in a Slow Cookerx, resulting in a delicious, easy curry. Heat ghee in a pan and brown the marinated chicken pieces on high heat. Dry the gravy to a minimum on high heat. Also see Tandoori Chicken 2, Tandoori Chicken 3, Tandoori Chicken 4, Tandoori Chicken 5.